South Coast Foundation was founded from the estate of Howard F. Cook. Originally part of the Cook Brothers Educational Fund, the foundation became independent in 1988. Initially, its grantmaking provided support to US environmental organizations. Within a few years, it initiated a grantmaking program focusing on South Africa. By 1993, this area of interest developed into its primary grantmaking program and all its efforts and resources were directed to it. The historic changes that took place in South Africa in 1994, as the country transitioned into democracy, established new development priorities and created opportunities for international donors to be directly involved. South Coast Foundation took advantage of these opportunities by moving its office from California to Cape Town where it was based for eleven years. During this period, the foundation worked primarily with community-based organizations (CBOs) and non-governmental organizations that supported CBOs in a wide range of sectors: rural women’s groups, community health organizations, land claims initiatives, skills building and education, income-generating projects, physically challenged, mental health programs, capacity-building programs and food security projects. 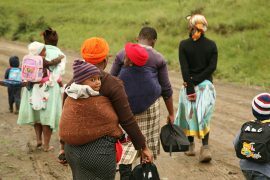 Throughout, the foundation’s resources have been directed to those it considers the most neglected and impoverished: those living in rural areas and informal settlements. To date, the foundation has supported over one hundred organizations. In 2005, South Coast Foundation returned to California where it continues to provide support to South Africa. Its current program addresses the impact of the HIV/Aids crisis on children. While the emphasis of its grantmaking has shifted over the past two decades, adapting to the fluid situation in South Africa, its transition to democracy and ensuing development challenges, the foundation’s mission in support of the impoverished people there has remained unchanged.